Stories, tips and recipes for Zamouri Spices customers. Around the Moroccan countryside, Argan trees grow. Most westerners have never heard of, let alone seen this variety of tree. And yet, western companies have realized the value of this rare tree. In the past few years, companies have begun marketing products made from the fruit of the Argan tree. So, you are asking, how does this help Moroccan women? To answer this question, we need to take a trip to Morocco and learn a bit about the Argan tree and how its fruit becomes the oil western consumers desire. Argan trees are native to the country Morocco. The tree is hardy and grows well in the dry climate of the Sous valley in southwest Morocco. Its extensive root system allows it to grow to to 25 feet and live more than a century in the semi-desert region. The thing that makes these trees valuable to western customers is the fruit. A mature Argan fruit measures around an inch and a half and is surrounded by a thick peel. Inside the fruit is the Argan nut which houses the oil-bearing seeds. It is the oil contained in the seeds that nutrition and cosmetic companies want. The production of Argan oil is a tedious process. Unlike many nuts, the Argan nut is difficult to crack. The strength of the nut makes the use of a machine to open it nearly impossible. Lucky for us, the Berber women have been opening Argan nuts and extracting the oil for centuries. The production line used in extracting Argan oil is not what westerners expect. After the Argan fruit is picked and dried, the berber women withdraw the pulp of the fruit leaving the solid portion of the fruit. The solid portion of the nut contains one or more seeds. To get to these seeds, the nut must be opened. This is done by using a rock to repeatedly smash it until open. Then each of the seeds must be opened in the same manner. After the seeds are open, the contents are removed. If the Argan oil being produced is for culinary use, these contents are roasted. Both the unroasted seeds, used for cosmetic purposes, and the roasted seeds are then pressed into oil and filtered. Until the Argan seed kernel is pressed, all of this work is completed by hand, just as it has been done for hundreds of years. Until the early 1990’s, Argan oil usage was largely limited to wealthier Moroccans. However, as scientists began to study the use of Argan oil, its benefits became more well known. Outsiders wanted access to this miracle oil. In order to provide commercial Argan oil, Berber women began to gather together and form cooperatives. Because it was difficult for these women to actually take part in the marketing of the oil, groups from europe helped organize traditional and mechanized cooperatives to profit from their work processing Argan oil. 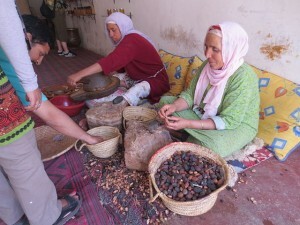 It is these cooperatives that allow Berber women to benefit from all the hard work they do producing Argan oil. As is the case in many developing countries, women in Morocco typically do not work outside of the home. Literacy levels for women in rural Morocco are estimated to be near 90%. For a woman who must work to support her family, working outside the home usually means low paying unskilled employment if she is not literate. The popularity of Argan oil has increased demand for the high quality product. Because all women cooperatives have been established, women are experience an increase in their quality of life. Women who participate in one cooperative have increase their income by ten times since the cooperatives were established. Many of these women have become the main breadwinners in their family. The cooperatives provide school for children while their mother’s work, as well as literacy education for the women themselves. This emphasis on education will allow not only this generation of women to increase their standard of living, but also the generations to come. The traditional production of Argan oil by hand ensures the highest quality of product. Purchasing your Argan oil from a company that supports this traditional method does more than just provide you with a quality product. It allows women who would otherwise have few opportunities a route to support their families and ensure education of their children. Keep this in mind while selecting the Argan oil products you purchase. Get more Zamouri Spices posts! Visit Zamouri Spices's profile on Pinterest.